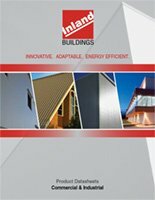 Inland Building Systems has provided pre-engineered buildings for over seventy years. Headquartered in Cullman, Alabama, Inland Building Systems started as a regional manufacturer providing the midwest with quality pre-engineered buildings. Inland Building Systems has grown to be a nationally recognized MBMA manufacturer. Inland Building Systems is anxious to provide you with the same quality products the rest of our customers know and trust. At a time when building requirements are becoming more and more difficult, the steel design is becoming more complex, and the costs seem to be going higher and higher, isn’t it time to let us show you how we can provide a cost effective building, with a design that meets your specifications, and provide you the customer service that is second to none! Give us a call and let us have the opportunity to show you how well we can perform. You may be surprised! Please fill out the fill out our Builder Application (PDF format) and fax it back to 1-800-438-1626. If you are interested in knowing more about becoming a part of the growing Inland Authorized Builder network, please contact us.